The reason that the cities appear to be in the wrong place is because the researchers – at the Centre International de Recherche sur l’Environnement et le Développement – have modelled the likely climate for each city, and then matched them against the place in Europe which currently has the most similar climate. 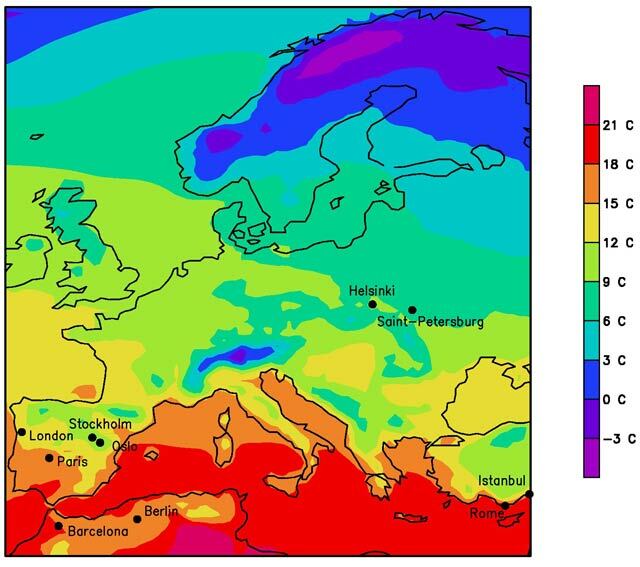 So So London 2071 has a climate similar to northern Portugal, Berlin like Yunis, and so on. Obviously this has big long-term implications for infrastructure – and for a lot more. Unfortunately there doesn’t appear to be an account of the research on the CIRED site, but the Guardian story is reasonably detailed. Many of the obvious implications they identify are about planning and infrastructure. The Portuguese and Spanish, for example, are used to shipping water over long distances, whereas, for example, the French and the British aren’t. And houses in northern Europe tend to have large west-facing windows to catch warmth and light, whereas these would make a southern European house unbearably hot. The implications go further, of course. The water supplies of the south-east are already stretched (London, if I recall correctly, currently has the same amount of water per head as Istanbul) and any supplies are likely to come from the north of England, Scotland or Wales. But of course water was one of the issues that originally gave an impetus to the fledgling Welsh nationalist movement (Welsh farms being drowned by reservoirs so that Birmingham got tap water) and one can imagine the resonance in a separatist Scotland of “It’s Scotland’s water”. Indeed, the CIRED researchers project that while the UK as a whole will have 3 degree rises, the South East will see 5 degrees. It seems to me that this is largely overlooked in the government’s present aspirations for the Greater South East. To put that in some sort of context, CIRED estimates that by the 2080s virtually every summer in England and Wales could be warmer than during the 1995 heatwave – if emissions continueto increase at present levels. Previous Previous post: Up to one billion refugees from climate change?